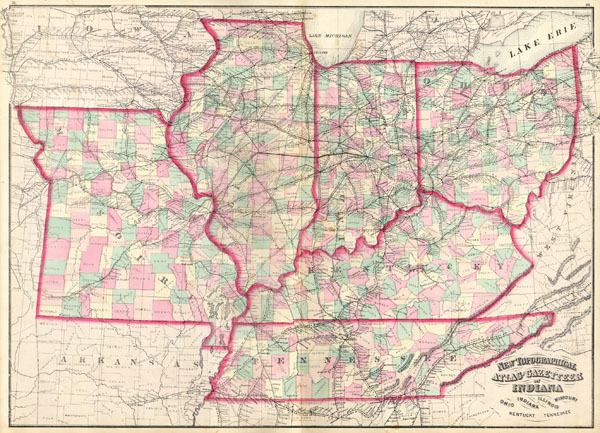 New Topographical Atlas and Gazetteer of Indiana, Ohio, Indiana, Illinois, Missouri, Kentucky, Tennessee. This is an 1874 Asher & Adams hand colored map of the Midwest and Central states of Ohio, Indiana, Illinois, Missouri, Kentucky and Tennessee. Active in the 1860s and 70s, the New York firm of Asher & Adams produced some of the most detailed and colorful late 19th century American Atlases. Asher & Adams are known for their remarkable state and county atlases which are so detailed that they include individual family homes and names. The Asher & Adams firm followed the quality and style formats pioneered by the earlier Colton and Johnson firms - notable for their distinctive pastel color washes and impressive size. Their most important work is their 1874 Asher & Adams Commercial and Statistical Gazetteer of the United States which is one of the first 19th century atlases to remove topographical information to make room for detailed depictions of railroads. Generally good or fine condition.